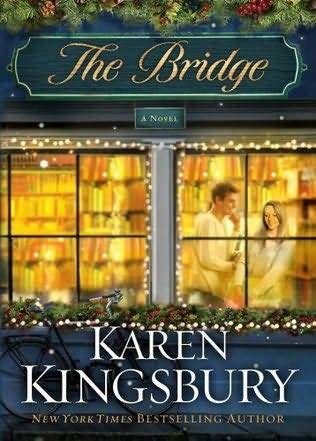 The Bridge by Karen Kingsbury – It's Time to Read! Ryan Kelly lives in Franklin and spends plenty of time at The Bridge-the oldest bookstore in historic downtown Franklin-remembering the long hours he and Kelly once spent there. Now, Ryan and Molly’s favorite bookstore is in trouble. For thirty years, Charlie and Donna Barton have run The Bridge, providing the people of middle Tennessee with coffee, conversation, and shelves of good books-even through dismal book sales and the rise of eBooks. Then in May a flood tore through Franklin and destroyed nearly every book in the store. By Christmastime, the bank threatens to pull the lease on The Bridge and is about to take the Bartons’ house as well. Despondent, Charlie considers ending his life. And in the face of tragedy, miracles begin to unfold. I received this book from Netgalley to review. I love Karen Kingsbury books – I recently finished the Above the Line series and fell in love with Kingsbury and how she writes. I will definitely be reading more books by her! The novel focuses around The Bridge bookshop. It is owned and lovingly run by Charlie & Donna, who named the place The Bridge because they saw books as a bridge to people and their problems. This is where many friends and couples spend many an hour hanging out and reading. This is true of Molly Allen and Ryan Kelly. When they were at college they would spend hours in The Bridge reading and falling in love. But it seems life has different plans for them and Molly ends up finishing college at home at her Father’s request; leaving them both heartbroken. Several years later a flood hits Nashville, destroying The Bridge. For 18 months Charlie & Donna try to find the funds to rebuild and restock but to no avail. In a desperate act, Charlie drives down country lanes in thick snow and straight into a tree. His accident brings Molly and Ryan back as they seek to help Charlie & Donna rebuild and as they pray for Charlie to survive. This is chick-lit with a twist. The book is full of love, hearsay and misunderstandings. But the twist is this: the characters all believe in God and hear His voice during the book. When Charlie is in despair, he cries out to God. Unbeknownst to Charlie, as he is driving down that road, Donna is seeking God to keep him safe. Friends of the bookshop, Molly & Ryan all cry out for Charlie to come through the coma on Christmas Eve – and they see the miracle of that. God answers His children in this book, He speaks clearly sometimes and always is He there. I loved that element of the book. This was a lovely read. It was a bit predictable – like all chick-lit really, but it was a quick and engaging read. This is one of those books I read in a matter of hours. It isn’t long but it is really enjoyable. I love reading storylines that involve books – no surprise there! – and I loved the idea of The Bridge. I really liked Charlie & Donna. Although they had faced many hardships they were still madly in love and cared for others over themselves. I really admired them and felt so bad for Charlie as he fought to save the bookshop, and thought that he had lost. All he wanted was to serve others, including Donna, and that was so touching. The storyline between Molly and Ryan was fairly standard for a chick-lit novel. Molly wasn’t allowed to date at college and she certainly wasn’t allowed to bring them home, even as friends, so their friendship grew in the bookshop. They spent one magical evening at Molly’s, while her staff were out, but one of them was back in time to witness their first kiss. Molly assumed they weren’t spotted as she never heard anything of it, but in fact her Father called Ryan and made it clear she was in love with someone from home. Ryan backed right off, which helped Molly make the decision to go home. Years later, both assumed the other one was married due to what others had said yet they were still in love with each other. Charlie’s accident drew them back to Nashville and after a few awkward encounters, back into each other’s arms. I didn’t mind the predictability of this storyline, although I did roll my eyes in places! I liked them both and it was sad to see how other people can influence us when it comes to making decisions. Overall, I enjoyed this book and will read more Kingsbury novel. Thank you Netgalley for letting me review it! I am rating this 4 out of 5 because it was a bit predictable and it didn’t completely blow me away, yet I did enjoy it and will recommend it to others. This is a nice, fun read – a good novel to read in an afternoon. Well, I haven’t read this one but after seeing your review, it seems that this book is worth a buy. Thanks for sharing such a good novel and I would expect some nice and inspiring love stories between Molly and Ryan.